Book Passage contributing blogger Zack Ruskin interviewed Jim Shepard (author of books including Like You'd Understand, Anyway: Stories, Love and Hydrogen: New and Selected Stories, and Project X) about his new collection You Think That's Bad: Stories ($24.95). 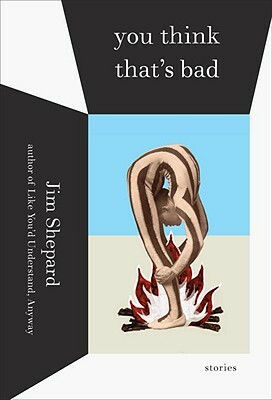 Jim Shepard will be appearing at Book Passage in Corte Madera on Saturday, May 7 at 4:00 pm. Zack Ruskin: When you first conceive of an idea for a story, at what point do you know if you have a short work or a novel? Have you ever changed from one medium to another after beginning a project? Jim Shepard: I’m just so happy to be working on something that doesn’t seem to me lame that I don’t worry at first what genre I seem to be moving into. That said, though, I haven’t worked on a novel in years. I have an idea for a new one, currently, but I’ve lately been much more interested in what I call the guerrilla nature of short story writing: get in fast, do what you need to do, and don’t stay any longer than absolutely necessary. As opposed to, say, to continue the analogy, the great massed maneuverings of entire armies that some novels feel like to me. ZR: If pressed to provide a thematic cohesiveness to your most recent collection of stories, You Think That's Bad, how would you characterize them? JS: There’s a preoccupation with catastrophe, first and foremost. I find myself trying to think of an arena in which the world doesn’t seem to be accelerating towards some pretty bad news. Accelerating because of our nature as human beings, which is to say in individual terms, the bad decisions we make each and every day, and in collective terms, our decision to have handed over our fate to global capital. Global capital has figured out how to game the system to effectively prevent us from A) seeing disaster coming and B) prioritizing safety over profit. Which means we have a lot of Deepwater Horizons ahead of us. I’m interested in the hearts and minds of the people complicit in such things. ZR: To what extent does your heritage and background represent itself in your text? Do you find it more interesting to write about characters that are vastly different from yourself, or do you prefer to explore people who are manifestations of yourself and those around you? JS: My heritage and background – especially in terms of class – seem to me evident in everything I do. And both, in terms of the second question. I’m interested in expanding what I imagine to be my empathetic reach, and in teaching myself about the world as I go, and so I’m naturally more attracted to characters whose lives are very different than mine. But of course I also have to feel or at least intuit that crucial overlap, even if it’s only initially a sliver, that’s going to allow the entire imaginative project to feel to me like it’s going to be possible in the first place. ZR: I don’t think it’s too controversial to say that short stories are claiming more a niche readership than they once did. Please name some short story writers who you feel should be in people's hands. JS: Boy: any number of short story writers should be in anyone and everyone’s hands. Here’s just a quick top-of-my-head list: Amy Hempel, Denis Johnson, Charlie Baxter, Miranda July, Deborah Eisenberg, and so many others. I could go on forever. I just came across Bonnie Jo Campbell’s collection and loved it. Some writers who are better known for their novels should be known at least as well for their stories: Ron Hansen and Robert Stone, for example. And then of course there’s the non-contemporaries: Flannery O’Connor, Joyce, Hemingway, Babel, Carver, Trevor, Chekhov, etc., etc., etc. ZR: How do you construct your dialogue? Do you mine everyday life for words or build your own speech to suit your stories? JS: I do both: for the more contemporary stories, I do what everybody else does and try to keep an ear out, and for the ones that require voices that are more alien in space and time, I try to immerse myself in whatever primary texts I can.